It's a bird... like a magpie, but with bluish wings, I think... it's got the same name as a letter of the alphabet... A,B,C,D,E,F,G,H,I... ? He didn't feel a thing. 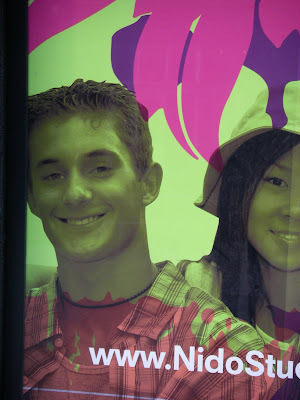 'Okay then, it's a mural for a hoarding outside some new student accomodation. So, let's not over-think this: we'll just get some studenty looking models, dress them in studenty gear like, I don't know, a guy in one of those short necklaces surfers and gap-yearers wear, that kind of thing. And once we've got the shots, we'll sort of splash them with washes of primary colours, to be like, youthful and vibrant, yeah? Hey students! Come stay with us! Our serial killers use Samarai swords so sharp, your decapitated head won't even fall off your body! ...and as he stands on the brink of becoming the most powerful man in the world, I still occasionally have to do a little mental check as to whether 'Obama' is the president elect's first name or his surname? See also, example of atypical murine / fuliguline amity in the works of Walt Disney. The plots of each short usually center on Tom's (the cat) numerous attempts to capture Jerry (the mouse) and the mayhem and destruction that ensues. Since Tom rarely attempts to eat Jerry and because the pair actually seem to get along in some cartoon shorts it is unclear why Tom chases Jerry so much. Some reasons given may include normal feline/murine enmity, duty according to his owner, Jerry's attempt at ruining a task that Tom is entrusted with, revenge, Jerry saving other potential prey (such as ducks, canaries, or goldfish) from being eaten by Tom or competition with another cat, among other reasons. Yes, it's a real puzzler, isn't it? Why does Tom (the cat) chase Jerry (the mouse) so much? Why aren't there more cartoon shorts in which Jerry (the mouse) helps Tom (the cat) with his tax return, or the pair of them do a crossword together? Why the constant chasing? Which of the some reasons given among other reasons can possibly explain it? I feel like we were almost on to something with 'normal feline/murine enmity', but... no, it's gone again. Just one of life's unsolved mysteries, I suppose. Maybe when Wikipedia has finally raised the six million dollars it keeps banging on about, we'll finally have the resources to work it out. This illustration is part of a horse race scene painted on the window of a bookies near my house. And what wonderful memories it conjures up of that glorious day at the races. All the gang were there: Gerry Adams, wearing his usual dirty beige mac and flat cap in case the weather was bad, and his cool shades in case it suddenly turned sunny. The bollard with a top hat on it that Gerry takes with them wherever he goes. The stunted James Bond villain, whose sinister experiments have left him with, on the debit side, a massive right leg, twice the width of his left; but on the credit side, the ability to levitate six inches above the ground. He was accompanied as always by Medusa, now almost recovered from that cartoon gas explosion she was involved in. And of course, Ascot simply wouldn't be Ascot without the presence of three evil midgets, two of them wearing enormous plate hats, one in a neck-brace, and one wearing a nightgown splashed with the blood of the victim of his latest frenzied knife attack. The other day, I was on the tube. It was busy, but not crowded - all the seats taken, one or two standees. I was seated. The tube stopped, and a middle-aged woman got on, and stood near me. And at once, I was thrown into my own private episode of 'Curb Your Enthusiasm'. You see, I quite like giving my seat up for people. It's easy, it's courteous, and it makes you feel at once youthful and self-righteous, which is an excellent combination, just ask Joan of Arc. I wish we still had the rule that a man automatically gives up his seat for a lady. But we don't, and so just as I was about to get up, it occurred to me that this woman might not be pleased if I did. She was quite overweight, so it was hard to judge her age- she could have been anywhere between 40 and 55. And if she was only 40, it might be really depressing - 'Oh God, I look so old someone actually offered me their seat on the tube!'. Or worse, what if she thought I was offering her it because she was so overweight? So I stayed sat down (and so did everyone else in the carriage, to be fair), but felt bad about it. Then, at the next stop, salvation. Another woman got on, who was definitely over sixty. Brilliant. I could prove to the first woman that I was the sort of person who gave up my seat to ladies of a certain age, but that her obvious youth and beauty meant she didn't qualify. I sprang to my feet with olde world charm, and the second lady, thanking me prettily, sat down. It was at this point that it occurred to me there was another possible interpretation of what I'd just done. Because the first lady was black, and the second was white. It might be that by sitting stolidly in my seat whilst a black woman stood, and then leaping up the moment a white woman boarded, I had come across as just a little bit... Klansman-y. I looked over to see how the first woman had reacted. And that's when I noticed that she wasn't quite as overweight as I'd thought. She was pregnant. An anonymous benefactor has pointed me in the direction of the Cervix Savvy website, which rather astonishingly manages not to have a single picture of a woman anywhere on it. Plenty more pictures of unusually cervically-savvy young men, though. My favourite is this chap in a cardy, pictured here in the act of giving the top excuse for not having a smear test. And, to be fair, it's an exceptionally good one. Don't get me wrong, I'm as feminist as the next man, or woman because it could be either, actually. However gender-blind we would like our government-funded organisations to be, can it really be a good use of NHS funds for this man to have a cervical screening? Because even with no medical training, I reckon I can accurately predict the result of that screening. I think it will be negative. On both counts. No cancer, of the no cervix.